Tiger Bill Reviews On The Beaten Path Progressive Rock by Rich Lackowski Book/CD from Alfred Publishing. If you have yet to see my review of the first volume in this series, check it out in the sidebar to the right. In that review predicted that author Rich Lakowski would, someday, put out a second volume. Well, that day has arrived even sooner than I suspected! This second volume follows the same format as the first but concentrates on drummers from the progressive rock genre. Let's check it out. Regardless of whether you are a drummer specializing in Jazz, Funk/R&B, Alternative/Punk Rock, Metal, Fusion, Reggae, Jam, Classic Rock, or Progressive Rock drumming, the best drummers on the planet are those who have studied the legends who came before them. Even the legends themselves have stolen or, if you prefer, borrowed techniques and ideas from those who have come before them. The best of the best then modify the licks they pick up and add them to their own bag of tricks. This is what helps you construct a unique style of your own. The initial volume in this series "On The Beaten Path:The Drummer's Guide to Musical Styles and the Legends Who Defined Them," featured the top three drummers in each of nine popular musical genres. As large as the book, with over 240 pages, it was impossible not to leave out many of the popular drummers in each genre. However, the fact that it was voted the number 1 educational book in Modern Drummer's reader's poll and number 1 in DRUM! Magazine's reader's poll certainly sent a signal to author Lackowski that he was on the right track! Rich has followed up the first volume with a book called "On The Beaten Path: Progressive Rock - The Drummers' Guide to the Genre and the Legends Who Defined It," which concentrates on a single genre that allows him to cover a dozen of the top drummers in great detail. The featured dozen are Barriemore Barlow, Terry Bozzio, Bill Bruford, Danny Carey, Vinnie Colaiuta, Phil Collins, Michale Giles, Gavin Harrison, Carl Palmer, Neil Peart, Mike Portnoy, and Jon Theodore. The book is laid out in twelve main chapters, each of which is dedicated to one drummer. Included are photos, biographical information, text/diagram of gear setups, and transcripts of three trademark grooves or solos by each artist. Author Rick Lackowski ranks each pattern for beginner, intermediate, and advanced level players and breaks them down into easily digestible segments. And, for those who can't read the music notation, an audio CD is included containing a demonstration of each pattern in the book. In addition to the main chapters there are additional ones covering Music Notation, The Kings of Progressive Rock Drumming (brief history of prog rock drumming including a timeline), and the author's own experience following The Path. An audio CD is included that contains 36 tracks that demonstrate each pattern and solo that appears in the written transcripts throughout the book. All tracks are performed by author Rich Lackowski. When I reviewed Rich's initial book, "On The Beaten Path: The Drummer's Guide to Musical Styles and the Legends Who Defined Them," I had a sneaking suspicion that he was only just getting started. As a matter of fact, I mentioned in the review that I thought another book might be in the works and it turned out that I was right on the money. I only wish I could pick out lottery numbers as accurately! 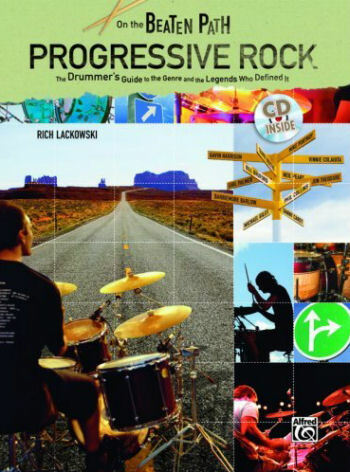 With this book/CD, Rich has broken out a single genre from his original book to allow drummers who are fans of progressive rock to get some solid inspiration by learning some of the best patterns from their favorite drummers. I strongly recommend this book for drummers of all styles, not only progressive rock stylists, because the beats and solos covered here can be modifed and used effectively in any style of drumming.